There are so many reasons why San Luis Obispo (SLO) is one of Livability’s Top 100 Best Places to Live. And we’ve got one more: Introducing Righetti, the newest masterplanned community from Williams Homes. This distinctive community of new homes in San Luis Obispo affords homebuyers the unique opportunity to live within a cherished stretch of central California, combining the ultimate location with spacious single-family homes. 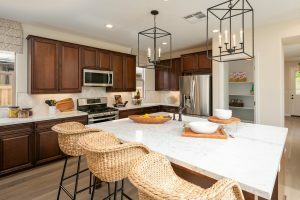 New homes in San Luis Obispo at Righetti reflect modern lifestyles. Featuring two enticing collections of new homes in San Luis Obispo, The Paseos and The Arroyos, featuring classic California architecture and modern floorplans in an idyllic setting, Righetti is already making waves as the area’s favorite new-home offering. Let’s take a deeper look at the city’s ranking on the Livability list, and why Righetti is making the promise of SLO living even greater. “It’s no wonder that travelers wanted to make a pit stop in this radiant California city, which has carved out a reputation for being the happiest place in America,” they said. The “average 300 days of sunshine every year and with more than 30 miles of trails in the city limits alone” certainly has something to do with it, and so do new-home communities like Righetti that provide the ideal foundation upon which to build an incredible life. “Its laid back California lifestyle and stunning natural beauty make it an obvious choice for our Top 100 Best Places to Live.” That casual nature with a zest for life is continued at Righetti. Here, you can spend the day exploring one of the many area wineries. “With more than 30 miles of trails in the city limits alone, it’s a sun-soaked paradise for any outdoor lover. Plus, some of the most beautiful beaches are located in SLO, including the family-friendly Morro Bay and Cayucos with its sweeping views.” And all of it is within a short jaunt from home when you live in the new homes in San Luis Obispo at Righetti. “Love wine? The warm and sunny climate also provides the perfect setting for more than 280 wineries,” they said. Once considered a hidden gem, the SLO wine country is developing quite a following. Wine Enthusiast magazine named San Luis Obispo one of its top 10 wine destinations last year, and the wineries’ convenience to Righetti means you can enjoy a glass anytime you want. “San Luis Obispo is nestled halfway between San Francisco and Los Angeles.” That puts it in the ideal spot to explore all of the state—should you ever want to leave your new home in San Luis Obispo! Excellent educational facilities at every level are a natural attraction for families. “SLO is also home to the prestigious and nationally-ranked California Polytechnic State University, a university known for its School of Agriculture and Natural Resources. Its K-12 schools are also top-notch, with six of SLO County’s high schools rated among the nation’s best,” they said. Buyers of new homes in San Luis Obispo at Righetti will benefit from being so close to all the fun, including the vibrant Downtown area with its variety of shops, eateries, and events—and creating their own! Here, you can take a hike, play at the park, and drink in the incredible natural landscape right within your own community. Two new-home offerings at Righetti provide ample opportunities for new homebuyers to live the dream in SLO. 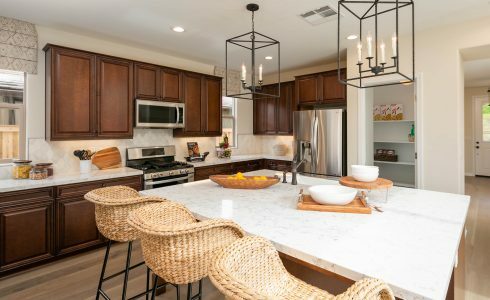 The Arroyos is an exceptional community of custom-quality, view-oriented homes with three to four bedrooms and two and one-half to three-baths in 1,684 to 2,534 square feet. These single-level and two-story homes feature welcoming front porches, gourmet kitchens with LG stainless steel appliances and Quartz countertops that open into generous living areas, and tankless water heaters and Tesla Solar Systems (structured as a lease with purchase option) providing energy-efficiency. These homes are priced from $771,895. The Paseos’ stunning new single-story and two-story homes offer 1,624 to 2,125 square feet of beautifully designed living space with three to four bedrooms, two and one-half to three-baths, and a focus on indoor-outdoor living. Chef’s kitchens boast GE stainless steel appliance packages, white thermofoil cabinets with designer hardware, and Quartz countertops, and flow easily into the home’s great rooms and dining areas. Prices for The Paseos start from $771,965. For more information about new homes in San Luis Obispo, visit Williams Homes. This renowned California builder was founded in 1997 on the principles of integrity, trust, and partnership and has continued to thrive as one of the state’s fastest-growing homebuilders. Williams Homes was the proud recipient of the 2013 Builder of the Year Award by the Building Industry Association.